Did you see Firefly when it was orginally broadcast? I sure didn't, and I'm not the only one. Cancelled after just 14 episodes, it was going to be Joss Whedon's next big move. Only no-one watched it. And I can kind of see why. It's not an easy sell, for one thing. A science fiction western! Yes, we know that many science fiction films are basically westerns, and that Star Trek was famously described as being Wagon Train to the stars (I don't know what Wagon Train is, but I'm guessing manifest destiny appears in there somewhere), but this one really plays up the connection. Oh, and it's not teenagers, it's adults. Yes, that's right, it's nothing like Buffy. I suspect it may also have been tainted a little by the rubbish that was Enterprise. Oh, but it's great. It's funny, and exciting, and has cute sayings, and great acting and the ship is just a superb design (Mister Monkey made me say that. Although I agree that it has a nice table in it) and it's fun and rollicksome and they've done a lot of work to make it look good. The 14 episodes just fly by. I didn't think the film was much cop though. As a film designed to wrap up a telly series for the people who had watched the telly series, it spent too much time on recap, and if you had never seen the series, you would wonder what purpose some of the characters serve, exactly, because there's very little for them to do. I love it so. Shiny. 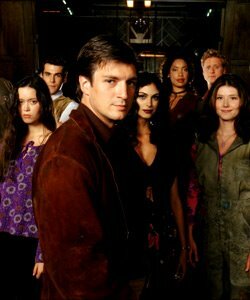 I saw Firefly when it got its first run on SciFi and loved it. Of course I loved it - she was all naked and articulate. I can't imagine anyone watching a whole episode and not liking it. It's more that there's little that would draw you in from the outside, and it clearly cost shitloads to make. The more I think about it, the more I like my Enterprise theory (since this was exactly what put me off it). Series good, film bad. Yes. I did wonder about the geography and economics of the whole thing though. Shiny indeed...brought the series with me on a business trip to Leeds (Sophistication...?) and missed it dearly when I reached the end. The boxset not the business trip. Film 2005 Movie of the Year! Apparently those that enjoyed it in the cinema had control over the interweb-something-or-other voting. I enjoyed both series and film. The film should have told us more about the priest/preacher type bloke, though. I think it was a bit lazy not explaining how he had sway with the Empire types. Also they should have written in the bad companion character. She was a ride. Only 19 more to go!